Who wants to bake in July? Well, regardless of the heat wave today, we really felt like having a yummy fruit tart … the kind that fills the home with its buttery aroma and that melts in your mouth… we made it with our homemade peach jam and here it is! We begin by preparing our shortcrust pastry: create a crater with the flour, place the soft butter cut into small pieces and the sugar in the centre, then mix. Add some salt, the lemon peel, the eggs, then mix everything together quickly. Let it sit in the fridge for about half an hour. If you wish to use an electric mixer, put the flour in first, then add the butter, turn on the mixer for a few minutes, then add the sugar, the salt and the lemon peel. Turn on the mixer again and add the beaten eggs. It’s ready! Create the tart in a baking pan, add the peach jam (use our recipe from the link below) and place some strips of pastry on top for decoration. Bake at 180° for about 30/35 minutes on high heat. Chi ha voglia di accendere il forno a Luglio? 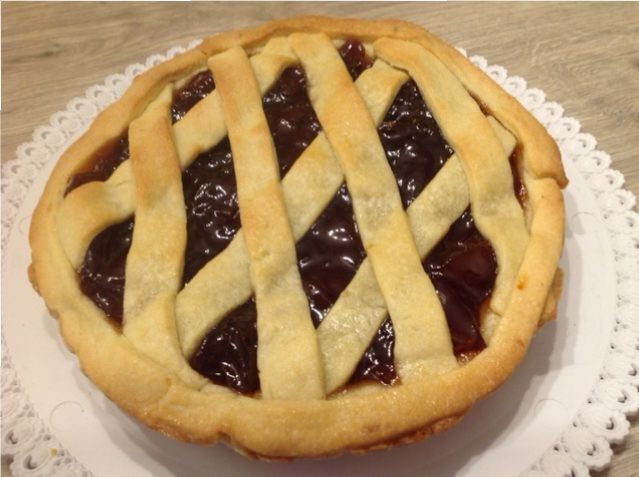 Beh, noi avevamo nostalgia di una vera crostata… di quelle che quando le mangi senti l’aroma di burro in tutta casa, di quelle che si sciolgono in bocca… e poi dovevamo testare la confettura di pesche! Iniziamo preparando la frolla: facciamo la fontana di farina, mettiamo nel centro il burro morbido tagliato in piccoli pezzi e lo zucchero. Amalgamiamo il burro e lo zucchero, aggiungiamo il sale e la scorza grattugiata del limone, mettiamo le uova e impastiamo velocemente con la farina. Lasciamo riposare il panetto in frigo per almeno mezz’ora. Se vogliamo usare la planetaria, mettiamo la farina e il burro freddo a pezzetti, azioniamo la macchina fino a quando il composto diventerà sabbioso, a questo punto aggiungiamo lo zucchero, il sale e la scorza del limone. Azioniamo per poco e aggiungiamo le uova sbattute. In poco tempo il panetto e ‘ pronto. Stendiamo un disco di pasta frolla in una teglia, aggiungiamo la nostra confettura (per la ricetta il link è qui sotto) e mettiamo le strisce di copertura. Inforniamo a 180° per 30/35 minuti massimo.